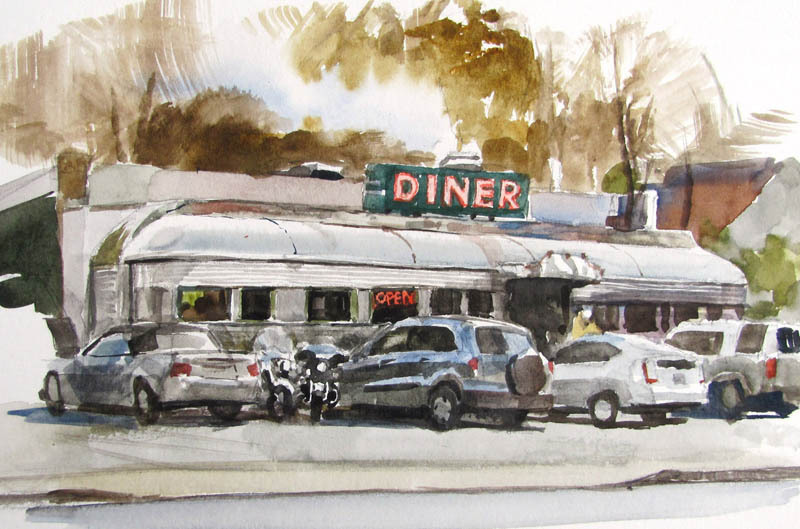 The Village Diner in Red Hook, New York, is a classic type of roadside restaurant popular throughout the northeastern United States. (Link to HD Video) It’s a vintage prefabricated “Silk City” model, dating back to the 1920s. The streamlined, railroad car look was meant to suggest cleanliness, speed, and efficiency. Throughout its lifetime, the diner has been picked up and moved twice. Jeanette and I have eaten there a lot and sketched the interior details, but this was the first time we'd painted it from the outside. in a Moleskine watercolor notebook . The brush is a 1/4 inch watercolor travel brush with a flat tip, good for architectural subjects. I started painting the motorcycles first because I guessed they would drive off soon, and they did! I then tackled the parked cars one by one, knowing they would all leave, too. Jeanette's using a homemade watercolor easel, basically a piece of plywood with a 1/4 inch hex nut attached to the backside of it so that it can attach to a camera tripod. Visit the GurneyJourney YouTube channel to sign up and see all my videos. Thanks to you and Jeanette for taking us along. It's a nice early Christmas present to us all. I just wanted to say that your blog and your books have been a great inspiration to me as I have recently began pursuing my passion for art. So thank you! It seems like you have been doing a lot of teaching lately based on your blog posts, but I was wondering, do you have any new/big projects (books, new worlds, etc.) in the works that we should be excited about? Thanks, Tom and Nicky, best wishes with your art. Right now I'm working on a couple of really exciting dinosaur illustrations for a science magazine. Can't say more about that or the other projects, but I will when the time comes. Love these video "process" posts. I could see a dvd compilation included with a career (so far) retrospective book of all your illustration work. Looking forward to the science mag dinosaur illustrations. Have a warm holiday season. Who was doing the filming? and Did you have to ask permission from the owner of the diner in order to paint the picture? Thanks - love your blog. Mary: Good questions. Our friend James Warhola held the camera for the shot from behind us both. He just happened by while we were painting and filmed for a bit. The rest of the shots were done by me, by setting the camera on a tripod and working it by remote control. I didn't ask permission, but I showed it to the diner owner and servers afterward, and they loved it. Wow! I see the cars came and left too. I can see that by the time you worked your way to the right a Toyota Prius (which is not in your video) came along. I love the detail. Finally... finally it arrived, my copy of your Dinotopia book. I'm so happy you decided to publish a 20th anniversary edition, because the first edition wasn't available anymore (at least not in Europe). Now I have it... and it looks AMAZING! Right, I'm off... got a story to read and color plates to dream into. Thanks and merry Xmas James & co! I want to thank you for such generous postings! I loved reading the story of how you developed Dynatopia. I so appreciate all the technical tips you share as well. Hope you and your family have a safe and peaceful holiday. Always enjoy both of your watercolors. ?... did you write 'Eye YoYo' on the cover of your Moleskin and what does it mean? I heartily second what Tom said -- it's a real treat to watch you work and see it come to life. Also, must be really great to share this kind of activity with your spouse. Lots of warm memories. Wow, thanks everybody. It's fun to make these little videos. Only takes a couple hours, and I enjoy sharing them with you all. David: Lately I've been writing a different title on each sketchbook using a paint marker. I liked "eye yoyo" just because the letter shapes look cool. I was also thinking of the ancient Greek idea of the "fire from the eyes" , where they thought of the eye reaching out and apprehending something, instead of the more modern notion that the eye is just an organ that responds passively to light. So an "eye yoyo" is like shooting your eyeball out to the object, and having it return with a sketch. I just wanted to thank you for all the great post' you made throughout the year and wish you a Merry Christmas. Wonderful stuff as always! It must be fun to spend some time painting alongside someone else! I've had the pleasure to eat at one of those prefabricated diners in my trip to the US. I was in Central Texas in December and temperatures were below-freezing outside, but the big breakfast they served in there really helped warm up for the day! It helped the staff was really friendly, too. No one has asked the most important question. Where did you get your hats? Iwant them both!